For Stefan Puente ’17, it was one of those coincidences that could be described as written for the movies. 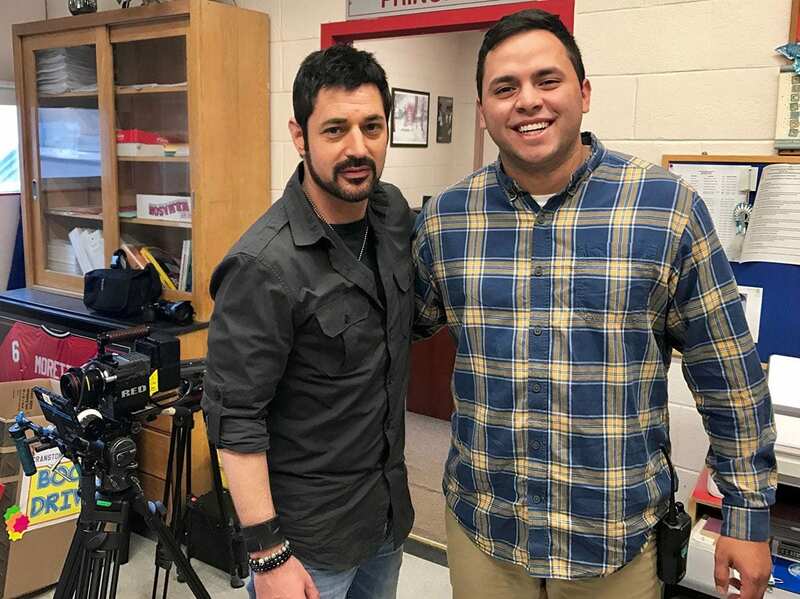 Earlier this year, Puente, then in the last months of earning his bachelor’s degree in management, began his film career as a production assistant on the upcoming Lionsgate release, The Santa Files, starring Ed Asner and Patrick Muldoon. He forged a professional relationship with producer David Gere ’97, who has made a name for himself in filmmaking with credits that include Bleed for This, the Martin Scorcese-backed biopic about professional boxer and Rhode Island native Vinny Pazienza. Puente, a film studies minor at PC like Gere, knew there were local connections to the film. But, he had no idea when he walked on the set for the first time that he’d meet a fellow alum who now has become a mentor and is helping the budding professional forge his career path. Furthermore, Puente and Gere both were mentored by Rev. Kenneth Gumbert, O.P., PC professor of film studies in theatre arts. Eager to start making his mark in the film industry, Puente wrote a letter prior to his senior year, asking well-known producer and Rhode Islander Chad Verdi for advice. 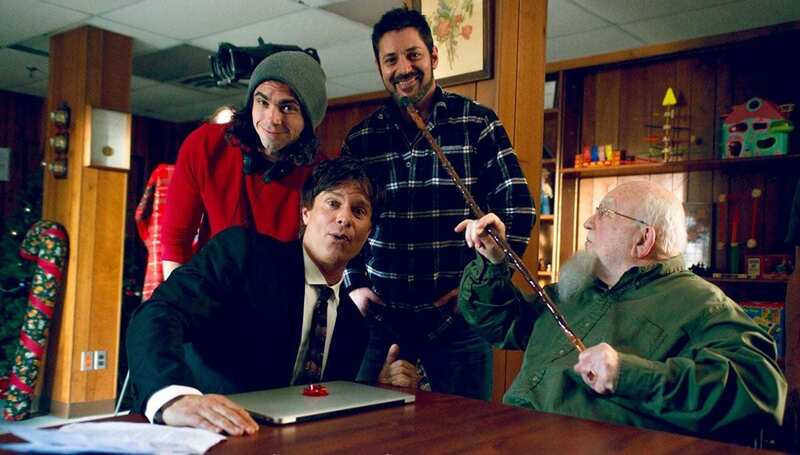 Verdi passed it along to his frequent collaborator, Tom DeNucci, another Rhode Island native who is a writer and the director for The Santa Files. DeNucci was looking for production help on the film’s set in Cranston, R.I.
Gere — whose business pursuits include Woodhaven Media, the production company behind The Santa Files and in which DeNucci is his partner — was a producer on the film. The two alums met, got to talking, and quickly established a relationship that continues to grow for both novice and master. Gere was impressed by Puente’s professional approach and passion. The two speak regularly and plan to work together on Day for Night, a film for which Gere is the executive producer and which will be filmed this summer in Connecticut. Neither Gere nor Puente intended to study film during their PC days, though they both cite falling in love with movies at an early age as foreshadowing their fate. Puente dabbled in the business as a child, appearing as an extra in The Adventures of Sharkboy and Lavagirl and Infamous when they filmed in his native Texas in the mid-2000s. But, he came to PC with visions of one day taking over his family’s real estate business. Through some friends, he became aware of the College’s film studies minor and its annual PC in Hollywood program, which affords students the opportunity to meet and learn from industry alumni working in Los Angeles. Puente participated in the program as a sophomore. The next year, he won the PC Student Film Festival for his short film, Dagger, which was later shown at the Rhode Island Film Festival. During Gere’s undergraduate years, the film studies program was still being developed by Father Gumbert. But Gere, whose early career aspirations focused on practicing law, took one of the Dominican’s classes as an elective and soon acquired a creative appetite while also finding a trusted friend and adviser. 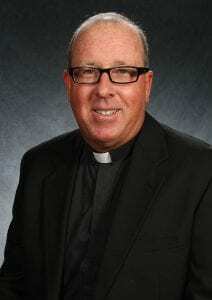 Father Gumbert has produced several films in his career, including the documentary Saving Grace, which examined religious persecution in the former Czechoslovakia. Twenty years later, Puente found the same level of interest and direction from Father Gumbert, whom he had as a professor in three courses. Puente and Gere extolled the impact Father Gumbert — who visited his former students on the Santa Files film set — made on their education and their preparedness for pursuing a career in a highly competitive industry. “All the opportunities I’ve been given now would not have happened if I didn’t make PC and Providence my home,” said Puente. “Father Gumbert and the faculty here pushed me and made sure I was on top of my work.” Benjamin K. Sweeney, adjunct professor of film studies, was one of those professors who encouraged and strongly influenced him, he said. Father Gumbert, who was recruited to PC in 1992 to teach film classes and later asked to develop the film studies minor program, recalled Gere as a constant presence in his office, a student focused on turning his enthusiasm into a viable future. Father Gumbert keeps in touch with Gere, as he does with many former students whose bright careers, he said, serve as inspiration for young students with the dream of making it in Hollywood. And Gere certainly has made his mark in the industry, with nearly three-dozen film credits as a producer. As an actor early in his career, he got a start in the 1999 film Outside Providence, produced by Peter Farrelly ’79 and his brother, Bobby Farrelly. The Santa Files, the story of a boy and his friends who overcome ridicule to prove that Santa Claus is real, is scheduled to have a limited theatrical release in Providence, New York, and Los Angeles in November, with a wide release in other locations and on other platforms to follow. Updates about Providence screenings can be found at www.woodhavenmedia.com.